CLM 6.0.2 comes with the server side implementation for the Plain Old XML profile or POXProfile. You can test this feature using one of the recent milestone builds. Based on the name you might think “great, one more reporting “feature” that requires a PhD just to get a PDF of my data” but the Plain Old XML Profile is designed to remove much of the complexity associated with creating traceability documents in RPE. In essence the POX profile allows a client (RPE, browser addon, curl etc) to request and receive Reportable REST XML from OSLC URLs. The feature is designed for document generation but you can use it whenever you need to access the XML representation of your data. 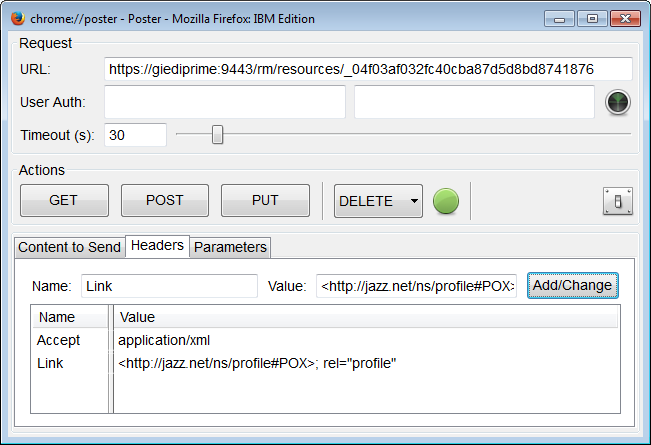 The image above shows using the POX Profile to get Reportable REST XML from DNG using the FireFox Poster addon. The is URL obtained from DNG’s “Share link” dialog. For document generation this essentially means that URL manipulation or additional server requests are no longer required for following links. See below for examples. This in turn translates into simpler templates that produce documents faster. The POX profile complements well using JRS as it simplifies fetching additional data attributes which are not available to JRS such as images and rich text. For such properties you need to request the data from the point product itself starting from the OSLC URLs returned by JRS. Below are some examples of the document generation flows with and without the POXProfile. Please note that the client side implementation is not available in the RPE GA but we are working on it. Previous Previous post: Can RPE work with Product X?